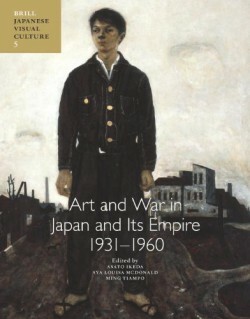 Art and War in Japan and its Empire: 1931-1960 is an anthology that investigates the impact of the Fifteen-Year War (1931-1945) on artistic practices and brings together twenty scholars including art historians, historians, and museum curators from the United States, Canada, France, Taiwan, Korea, and Japan. This will be the first art-historical anthology that examines responses to the war within and outside Japan in the wartime and postwar period. The anthology will scrutinize official and unofficial war artists who recorded, propagated, or resented the war; explore the unprecedented transnationality of artistic activity under Japan’s colonial expansion; and consider the role of today’s museum institutions in remembering the war through art. Contributors include: Asato Ikeda, Aya Lousa McDonald, Ming Tiampo, Akihisa Kawata, Mikiko Hirayama, Mayu Tsuruya, Michael Lucken, Bert Winther-Tamaki, Mark H. Sandler, Maki Kaneko, Kendall Brown, Reita Hirase, Gennifer Weisenfeld, Kari Shepherdson-Scott, Aida-Yuen Wong, Hyeshin Kim, Laura Hein, and Julia Adeney Thomas. Asato Ikeda is a lecturer at the University of Victoria. She is currently writing a monograph that investigates Japanese wartime paintings through the framework of fascism. Aya Louisa McDonald is Associate Professor of Art History at the University of Nevada, Las Vegas. The author ofLes Trente-six Vues de la Tour Eiffel, she is completing a study of Fujita Tsuguharu. Ming Tiampo is Associate Professor of Art History at Carleton University. She is the author of Gutai: Decentering Modernism. She is currently co-curating a Gutai exhibition for the Guggenheim Museum in New York City.